Lion Air full-service subsidiary Batik Air is aiming to expand into the international market in late 2014 and operate several international routes from four Indonesian gateways by the end of 2015. The international expansion follows an initial domestic focus; 22 of the 23 routes to be operated by Batik by the end 2014 will be domestic. The international expansion is expected to start in 4Q2014 with Jakarta-Singapore service, followed by Jakarta-Kuala Lumpur in early 2015. Batik plans to also launch international flights by the end of 2015 from Bali, Batam and Makassar as China, Hong Kong and Australia are gradually added to its network. The Batik international expansion plan is ambitious and will face several challenges. Competition will be fierce while traffic rights, slots and approvals from foreign regulators could prove elusive in some of the targeted markets. Batik has an unknown brand overseas, which will make it hard to sustain its 90% load factor as it spreads its wings. Batik launched services in May-2013 and currently operates 36 daily flights on nine routes with a fleet of six 180-seat two-class 737-900ERs. The market has so far responded well to Lion’s foray into the full-service market with Batik already surpassing the one million passenger milestone and reporting an average load factor of 90% since its launch. Batik is now taking a brief hiatus from expansion but will begin a major growth phase in Jul-2014, when it takes its first 156-seat two-class A320. A second A320 will be delivered in Sep-2014, followed by four aircraft in 4Q2014 for a total of six A320s by year-end. As CAPA first reported in Sep-2013, Batik will be the first Lion Group carrier to operate A320s. Batik CEO Achmad Luthfie said at a 27-Feb-2014 press conference in Singapore that Batik also plans to take in Aug-2014 its first 737-800, which will have 162 seats in two-class configuration. A second 737-800s will be added in Sep-2014 followed by two more in 4Q2014, giving Batik a total fleet of 16 aircraft by the end of 2014 (six 737-900ERs, six A320s and four 737-800s). The addition of 10 aircraft within only a six-month period will allow Batik to rapidly expand its domestic operation from nine to 22 domestic routes. Its domestic network will expand from 10 to 22 destinations while 64 daily flights are added for a total of 100. As Batik almost triples in size during 2H2014, services to Banjarmasin, Batam, Denpasar Bali, Gorontalo, Kendari, Medan, Padang, Palembang, Palu, Timika, Tarakan and Solo will be launched. Of these 12 destinations, 11 will be served from Jakarta Soekarno-Hatta while Timika in east Indonesia will be served from Jayapura and Makassar. The carrier currently serves Jayapura and Makassar from Jakarta along with Ambon, Balikpapan, Jogjakarta, Kupang, Manado, Pekanbaru and Surabaya. While Batik was looking at moving its entire Jakarta operation to secondary airport Halim it has decided to stay at Soekarno-Hatta in order to maintain connections with its sister carriers in the Lion Group. 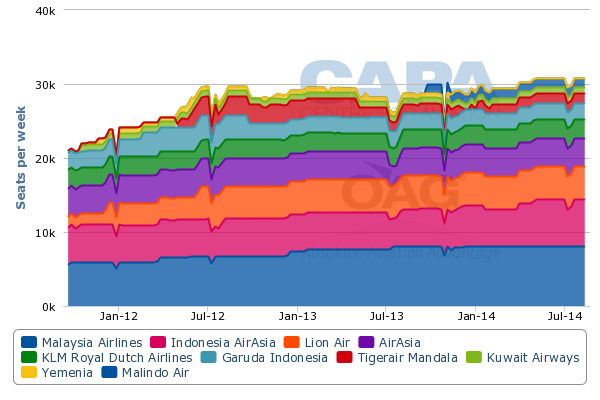 Batik operates alongside Lion Air on all nine of its existing routes, according to OAG data. Lion also currently serves 10 of the 13 domestic routes Batik plans to add in 2014. The only exceptions are Makassar-Timika, Jayapura-Timika and Jakarta-Gorontalo. Neither Lion nor its regional subsidiary Wings Air currently serve Timika, which is a fast-growing destination in Indonesia’s resource-rich easternmost Papua province. Lion does serve Gorontalo but only from Makassar and Manado, according to OAG data. Batik will be the only carrier operating non-stop flights from Jakarta to Gorontalo, which is located in the north part of the central Indonesian island of Sulawesi. The Batik and Lion brands are designed to target different segments of the market with Lion operating 737-800/900ERs in single-class configuration without in-flight entertainment (IFE) and selling food and drinks. Lion, however, does over complimentary checked bags and unlike most LCCs is a network carrier and prices itineraries by city pair rather than sum of sectors. Batik has a separate 12-seat business class cabin offering seats with 45in pitch in two-by-two configuration. The same number of business class seats will be retained as the carrier starts to operate smaller 737-800s and A320s. Batik’s economy class cabin is in standard three-by-three configuration but offers slightly more generous pitch, 32in, than Lion. Economy passengers are also served complimentary meals and drinks. Batik also offers seatback IFE monitors in both cabins. The carrier on 27-Feb-2014 announced the selection of Lumexis as its IFE supplier for its new 737-800 and A320 fleets. Lumexis will supply a fibre optic network, which will result in significant weight savings while offering the same programming as the system Batik is using for its initial fleet of 737-900ERs. 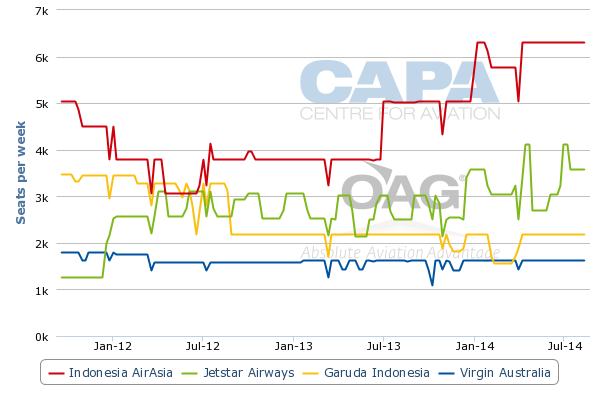 Batik’s main competitor is Garuda, which is by a large margin the market leader in Indonesia’s full-service sector. Garuda currently competes with Batik on eight of Batik’s nine routes (the only exception is Jakarta-Kupang). Of the 13 routes being added by Batik in 2H2014, eight are now served non-stop by Garuda. The exceptions are Jakarta-Kendari, Jakarta-Tarakan, Jakarta-Palu, Jakarta-Gorontalo and Jayapura-Timika. Garuda serves all these destinations as well as Kupang but only from its regional hubs, primarily Bali and Makassar. Batik aims to entice Garuda passengers in these markets by offering an exclusive non-stop option as well as a more competitively priced full-service product. Batik generally prices its tickets in both cabins below Garuda but above Sriwijaya Air, which is full-service but is categorised as a middle market carrier while Garuda and Batik are considered top of the market. Sriwijaya currently operates three of Batik’s current routes and eight of the 13 domestic routes Batik is adding in 2H2014. While Garuda is Batik’s main competitor, Sriwijaya is potentially more vulnerable as Batik pursues domestic expansion. Another middle market Indonesian carrier, Batavia Air, ceased operations in early 2013 while government-owned regional carrier Merpati suspended operation in Jan-2014. With Tigerair Mandala slashing capacity and now only operating four domestic routes with one daily frequency each, Lion and Garuda (and their dual brands) are left as the only competitors along with smaller Sriwijaya and Indonesia AirAsia on most main domestic routes. While Sriwijaya is almost entirely a domestic carrier, Indonesia AirAsia focuses more on the international market and plans to reduce its domestic capacity in 2014. Batik’s 100 daily flights (50 return flights) by the end of this year will allow the carrier to overtake Indonesia AirAsia as the fifth largest domestic carrier in Indonesia after Lion, Garuda, Citilink and Sriwijaya. Batik should account for approximately 5% of domestic seat capacity in Indonesia by the end of Dec-2014. Lion and Wings currently account for about a 50% share. The group has repeatedly stated it seeks to grow its share of the Indonesian domestic market to 60%. While the first priority for Batik is to build out the domestic network – which explains the massive domestic expansion to be pursued in 2H2014 – the carrier also has huge international ambitions. 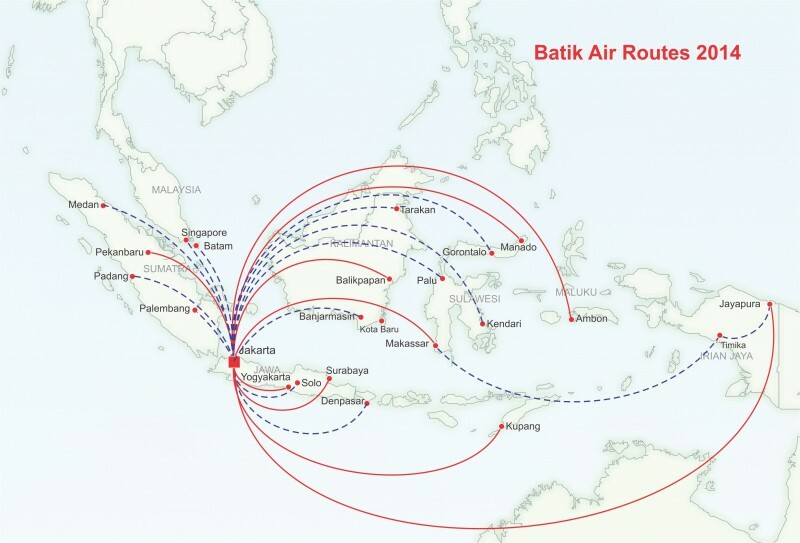 Batik aims to start operating international services in late 2014, but has just one route in its 2014 plans – Jakarta-Singapore. Capt Luthfie announced at the 27-Feb-2014 press conference that Batik aims to launch Jakarta-Singapore in Nov-2014 or Dec-2014. He said Jakarta-Kuala Lumpur is intended to be the carrier’s second route with service launching in Jan-2015 or Feb-2015. Batik plans to operate 737-800s on all its planned international services. Both routes are highly competitive and have already seen significant capacity expansion over the past year. Jakarta-Singapore has about 65,000 weekly seats, making it the world’s second biggest international route, while Jakarta-Kuala Lumpur has about 30,000 weekly seats. 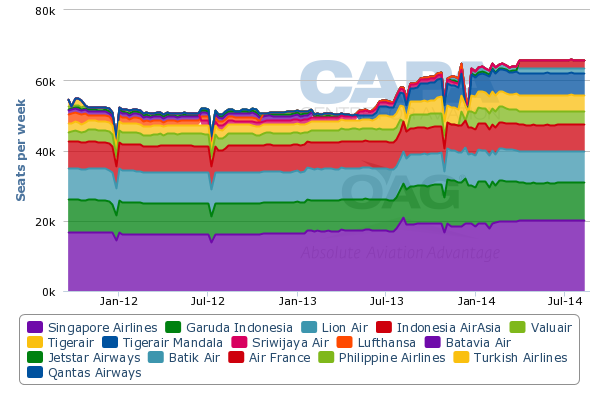 Assuming two daily flights (Batik has not yet decided on the number of frequencies it will operate), Batik would only capture a 3% share of the Jakarta-Singapore market and a 7% share of the Jakarta-Kuala Lumpur market. Assuming Batik’s plans for 2015 are not adjusted over the next several months, 2015 will see massive network expansion. Capt Luthfie says the 2015 network plan includes more international services from Jakarta along with the launch of international services from Batam, Manado and Bali. The carrier is also planning more rapid domestic expansion in 2015, including at least five new domestic destinations – Bengkulu and Jambi on Sumatra and Manokwari, Sorong and Ternate in east Indonesia (all of which will be served from Jakarta). Capt Luthfie says Batik plans to add 20 to 30 aircraft in 2015, which would more than double the carrier’s fleet. Several of the aircraft will be placed at new bases at Batam and Manado. Capt Luthfie says Batik aims to open Batam in early 2015 as its second base after Jakarta. This comes as no surprise as the Lion Group earlier unveiled a broader plan to grow Batam into a major and domestic and international hub as well as establish a maintenance base on the island, which is located near Singapore. As CAPA first reported in Oct-2013, the Lion Group intends to use the Batik brand to operate international flights from Batam including to Greater China and India. The group prefers to keep Lion operating flights of three hours or less while Batik is used to open up new medium-haul markets. Lion’s current international network from Indonesia is limited to a handful of regional destinations in Southeast Asia along with Saudi Arabia, which is operated with its niche fleet of two 747-400s. See related reports: Lion Air to expand Batam hub. Can it emerge as an alternative to nearby Singapore Changi? Capt Luthfie expects Hong Kong to be the first international route from Batam with services starting in early 2015. Batam currently only has one scheduled international route – to Kuala Lumpur Subang operated by Lion affiliate Malindo and Malaysia Airlines subsidiary Firefly. The new international services from Batik – which in addition to Hong Kong are also expected to include Bangkok, Guangzhou, Delhi and Mumbai – will not likely generate significant local passengers. Instead the group will leverage Batam’s central geographic position and ample space (compared to the congestion of Jakarta) to move passengers from throughout Indonesia onto Batik’s international network. Lion and Wings already operate over 15 domestic routes from Batam and plan to add several more before Batik also opens a Batam base. Batik will also likely operate some domestic flights from Batam alongside the Lion and Wings brands. The Manado hub is expected to open in May or Jun-2015. Batik aims to initially operate flights to mainland China from Manado, which is a popular diving spot and holiday destination. But the China flights are contingent on a runway extension project being completed in time. The current runway at Manado precludes flights of over three hours. Currently Manado has only one international route – a four times per week service from Singapore operated by SilkAir. Capt Luthfie says Batik also plans to operate international flights from Bali starting in late 2015. He expects the carrier’s first international route from Bali will be Perth followed by Brisbane. Other Australian destinations could be added in 2016 or 2017, when Batik hopes to add widebody aircraft. Lion announced an order in 2012 for five 787-8s which were intended for Batik. Lion recently decided to cancel the order but has been looking at potentially acquiring other widebody aircraft. Capt Luthfie says there were performance issues with the 787s that Lion ordered. The 787s earmarked for Lion were early production aircraft, which are heavier and lack the range of current models. Even if widebody aircraft are not acquired Batik could add destinations deeper into Australia and further in Asia using new-generation narrowbody aircraft. The Lion Group has ordered both the A320neo and 737 MAX, which are expected to enter service in late 2015 and late 2017 respectively. Capt Luthfie says Batik will likely operate narrowbody routes of up to seven hours once it takes the A320neo and/or 737 MAX. Unlike the Batam and Manado routes, Batik will face intense competition in the Bali-Australia market. Batik’s first Australia route, Bali-Perth, is particularly competitive with 32 weekly flights from Indonesia AirAsia, 17 weekly flights from Jetstar, 10 weekly flights from Garuda and nine weekly flights from Virgin Australia. Citilink also has selected Bali-Perth as one of its initial international routes with services expected to start in late 2014. Capt Luthfie says Batik has been approached by several Australian airports which are eager to attract new full-service carriers from Indonesia, particularly Bali as the Bali-Australia market is mainly served by LCCs. Bali-Brisbane, however, is an exception as it is currently only served by Garuda and Virgin Australia. Bali-Australia will not be an easy market for Batik as it consists almost entirely of inbound leisure passengers. Competition is intense, yields are generally low and the existing carriers in the market have recognisable brands in Australia. Securing regulatory approval from Australia’s Civil Aviation Safety Authority (CASA) will also be a challenge. Lion so far has repeatedly pushed back consideration of Australia services, recognising it may not yet be able to pass the high standards of CASA. With Batik a fully-owned subsidiary of Lion, the same issues will confront Batik. Batik will face different kinds of challenges in its first two international markets, Singapore and Kuala Lumpur. Both markets are highly competitive with several full service and low-cost carriers already operating. In Singapore, Batik’s biggest challenge will be securing slots that are needed to make the route viable. Batik seeks peak hour slots and hopes to operate at least two daily flights. It cannot afford to settle for off-peak slots or a low frequency schedule given the needs of the business passengers that shuttle between Singapore and Jakarta. Batik is optimistic it can secure peak hour slots at Changi, believing Indonesian authorities will be able to obtain some slots on its behalf as Indonesian carriers are relatively under-represented on the route. But while traffic rights to Singapore are available for Indonesian carriers, peak hour slots at Changi as a general rule of thumb are currently not available. There are always exceptions and Batik undoubtedly noticed that Garuda picked up extra peak hour slots at Singapore in 2013 after Changi made an exception for the Indonesian flag carrier. The extra Garuda slots came as part of an unofficial exchange between Singapore and Indonesia as Singapore Airlines (SIA) at the same time secured an additional peak hour slot pair at Jakarta, which it used to launch a ninth daily frequency. SIA is now seeking yet another slot pair at Jakarta, an indication of the continued growth in full-service demand in the Singapore-Jakarta market. Batik and Lion perhaps believe they can be on the other end of the exchange this time. But Garuda is also seeking more Changi slots and is the Indonesian flag carrier, which generally comes with preferential treatment. Batik is not the first Lion subsidiary or affiliate to state intentions to serve Singapore without first securing slots. Malindo and Thai Lion also aim to launch services to Singapore in 2014. Lion Air has seven existing slot pairs at Changi but intends to maintain its current Changi schedule, which includes six flights to Jakarta and one flight to Ho Chi Minh. The group will likely have to settle on off-peak slots, which would put it at a competitive advantage, or defer some of the additional flights it has planned for the Singapore market. Kuala Lumpur will be an easier port to serve as there are no slot restrictions and could consequently become Batik’s first international destination if the carrier is unable to resolve the slot challenge at Singapore. But Jakarta-Kuala Lumpur is a smaller market than Jakarta-Singapore, particularly from a full-service perspective. Indonesia’s international market is generally underserved, a hangover from its protective policies, leaving huge opportunities for Indonesia’s domestic carriers. But Batik will have to rely primarily on Indonesia point of sales as it starts to expand internationally. Some routes may not have the yield to support its roomy configuration and full-service model. Batik has quickly gained traction domestically, emerging as a serious competitor to Garuda at the top end of the market. But succeeding in the international market will be more challenging. The carrier may ultimately have to adjust its plans for a big international network along with its potentially over-ambitious plan for growing its fleet to up to 46 aircraft by the end of 2015.